Spring may have officially started today, but my excitement for the new season kicked off several weeks ago. I'm talking, of course, of the native bee season. Which bee will be first? From my kitchen window I watched the first of the striking purple blooms of the Hardenbergia violacea (aka Purple Coral Pea, False Sarsparilla or 'Happy Wanderer') appear in mid-July, knowing that this plant is typically the first place native bees are seen after winter. On August 11th a casual glance out the window as the kettle boiled revealed an insect zipping and darting around and between the flowers that looked different to the more sedate and predictable patterns of the usual visitors - honey bees. Quick! 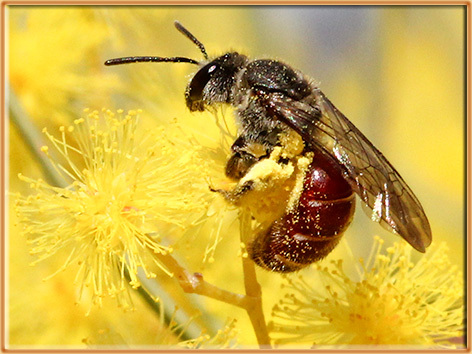 Grab the camera - it's the first native bee sighting of the season! I raced outside, camera in hand. I nearly skidded as I stopped in front of the flowers. But no, all I could see were honey bees. Oh dear Karen, now you're seeing native bees that aren't there? This really has got out of hand. But wait, as I replaced the lens cap, there was a short dart between flowers. I leaned closer. There was a native bee! Sure enough, it was a "spring bee" as they are commonly known. One of the Trichocolletes species. I shot a few poor photographs before it headed off (that's one of them, above). I noted the weather - the flowers were in patchy sunshine and the ambient temperature was 13 degrees. That's quite a way below the expected preferred minimum temperatures suggested for native bees to be out, of about 18 degrees. Interestingly, this sighting is also eight days earlier than my first sighting (of the same species, I think) last year. (You could also question whether I'm getting better at spotting them, or even looking for them, that is influencing this result, but I do tend to be looking from early August ... just in case!). The first native bee I saw this season - Trichocolletes sp. And below is a another of these bees (a female?) taken later in the month when I'd had time to calm down, and there were more of these bees about. These bees are a little smaller than honey bees, with similar coloring, which can make them a bit tricky to spot. I tend to look for the darting flight pattern, and if they stop long enough on some flowers, you can notice their distinctive bands, scopa (hairs for collecting pollen) and body shape that all help to distinguish them. After that, despite the mostly chilly weather, when the temperatures climbed even a little and the sun appeared, so too did these bees. And Trichocolletes weren't the only ones. On the 15th of August, while returning from delivering a workshop in Corowa, I received an excited text from Manu, reporting that she'd seen Hylaeine bees emerging from geranium stems in her backyard. Gee, I haven't seen any of them yet this year, I thought. (Along with, wow, what are the odds of seeing them emerge if you didn't know they had nested there!?). I arrived home and took a quick look at the daisies on the front nature strip, and what should I see? Hylaeine bee video (30 seconds) on Vimeo. With their less hairy body and legs, and relatively slim stature, I'm sure these bees are frequently assumed to be wasps rather than bees. That was certainly my thought when I first saw them some years ago. Instead of carrying pollen on their bodies they have a crop, and carry itinternally instead. 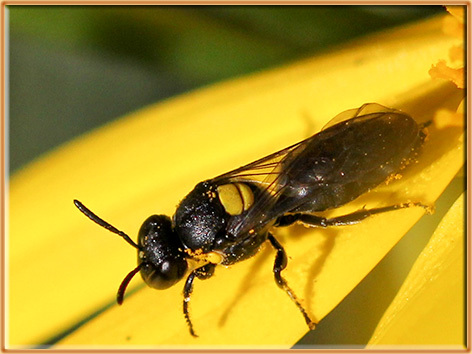 They swallow pollen and nectar, then regurgitate it once at the nest. August 23rd was the next milestone. Again it was a single bee that caught my eye. Again it was the front daisies that it was foraging on. Species number three joined the list. Our Snowy River wattle (Acacia boormanii) has yet again had a lovely display of blooms right through August. After seeing early bees on it last year, I had kept an eye on it, but had 'only' seen honey bees, flies, bugs and beetles to date. That changed on August 28th when I spied several native bees amongst the flowers. These 'red bees', Lasioglossum species, made for four species spotted in August! I'm thrilled. I added each of these sightings to BowerBird.org.au (follow the links from the photos above to see the respective entries on that website). This was partly so the records might add to the range and distribution records for these species. But also to see if I was on the right track with my identification of these bees (for me, even getting to the right family can be a challenge - anything beyond that is a bonus. Being able to seek advice via BowerBird is invaluable - and I love that it means you don't need to be an expert to contribute your observations). Fortunately for the most part I did ok. And for the one I mucked up, Dr Ken Walker kindly provided a detailed explanation about the ID, which I much appreciate and hope I can put into practice next time. How did winter finish up (according to the calendar at least) in your neighbourhood? Any nature observations to share? 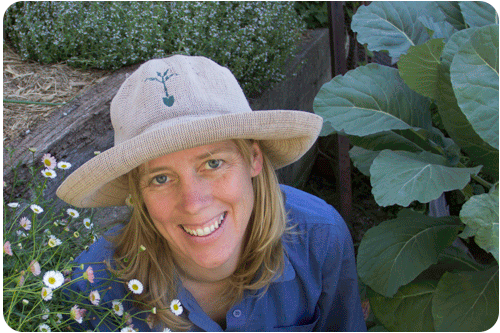 Had a go at looking for native bees at your place yet this season?